Why is Dolly Parton a gay icon? Most would agree that it’s largely because of her flamboyant, larger-than-life image. In the world of drag, she has no doubt been one of pop culture’s most imitated women. Others would add that her fiercely independent spirit and sense of style also endear her to us. But there’s a deeper reason why Ms. Parton is a true hero to GLBT’s… and perhaps no one can explain it better than Dolly herself, with classic simplicity: In the lively “Hollywood to Dollywood”, new to DVD, the acclaimed singer/actress/businesswoman declares, in a clip from a 2010 CNN interview, “I think I’ve always been accepted by the gay community because I accept THEM… We’re supposed to love each other exactly for who and what we are.” Dolly enjoys the unique distinction of having a particularly diverse contingent of fans, with her followers ranging from the GLBT community to members of the religious right. She’s clearly one of America’s most beloved superstars. It is largely that love for Dolly that inspired brothers Gary and Larry Lane to spend almost five years writing a script, named “Full Circle”… and, more ambitiously, to deliver that script to Dolly Parton personally during Dollywood’s 25th Anniversary Celebration. One of the duo explains, “The two gifts that Dolly has given us– given the world– is (1) her music; and (2) her courage to live her life and to be herself… and that kind of gave us the inspiration and courage to write this really heartfelt script and actually be open, finally, about our lives… and to pour all our feelings into this script.” The Lane brothers are two all-American-looking, identical gay twins who were raised in a VERY religious family in North Carolina– a fact that colored every aspect of their 35 years of life. (One of the two reveals, “There’s a lot of stuff that even to this day, we can’t tell our mom.”) Today, they are living in Hollywood and hanging out with the likes of Chad Allen, Leslie Jordan, and Dustin Lance Black. Gary and Larry, along with Gary’s boyfriend Mike, rent an RV (christened “Jolene”) and kick off their five day trip… from “Hollywood to Dollywood”. Along the way, the trio encounter such forces of nature as fierce winds in Amarillo, flooding in Nashville, and the famous “Night of 1,000 Dollys” in Knoxville. The premise of two handsome gay identical twins making a road trip to meet their idol is a pretty titillating premise to begin with… and fortunately for the audience, the filmmakers do keep the RV wheels– and the viewers’ interest– moving at a nice pace, complete with plenty of Dolly on the soundtrack. 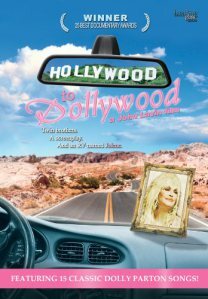 Equal parts documentary and road movie, “Hollywood to Dollywood” indeed showcases the brothers’ devotion to their muse (In one particularly cute scene, they sing “Jolene” at an Arkansas gay kareoke bar). 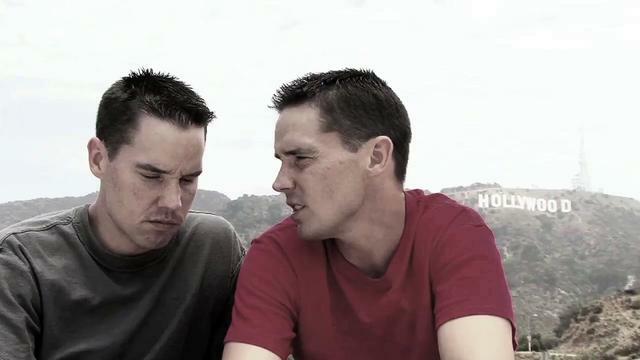 The movie also equally explores the pair’s long, continuous struggle with growing up gay in a Southern Baptist culture, and with having a family who are– to put it diplomatically– very slow to warm up to the brothers’ being “out”. Bumpy relationships notwithstanding, and although we never meet any of the twins’ family in the film, Gary and Larry frequently declare that their relatives are the most important thing in their lives. They often bring up their family throughout the film, especially their mother… sometimes, it may seem, a bit too much. Some viewers may bemoan that the Lane twins’ story of their struggles for acceptance by their loved ones overshadows the more glamorous “Finding Dolly” aspect of the film. Others will find it quite provocative… as well as an inspiration for all of us to find the balance between “being yourself” while still maintaining the proverbial “ties that bind”. Gary and Larry Lane eventually make it to Dollywood, where they have “three chances” to get their script into Ms. Parton’s hands. Will they do it? I won’t give away the climax of “Hollywood to Dollywood”, but let’s just say that it’s a moment that the Lane twins– as well as the viewer– are not likely to forget for a long time. Whether or not the brothers’ script “Full Circle” will ever come to life remains to be seen at this time. However, it seems that this desirable duo have already made their own highly personal mark in pop culture history with their new movie. With “Hollywood to Dollywood”, our Dolly gets a loving homage by two of her most dedicated fans. This is a road trip worth taking. “Hollywood to Dollywood” is now available on DVD. Visit http://www.BreakingGlassPictures.com for more info. Next DVD Review: "DEL SHORES: SORDID CONFESSIONS"